(Text automatically translated) In an old building in the heart of the historical center, the 'flat, "THE PIT", is completely renovated and equipped with every comfort. Spacious and bright, with two bedrooms and two bathrooms and can accommodate up to seven people.The 'apartment is not shared, but is given exclusively. 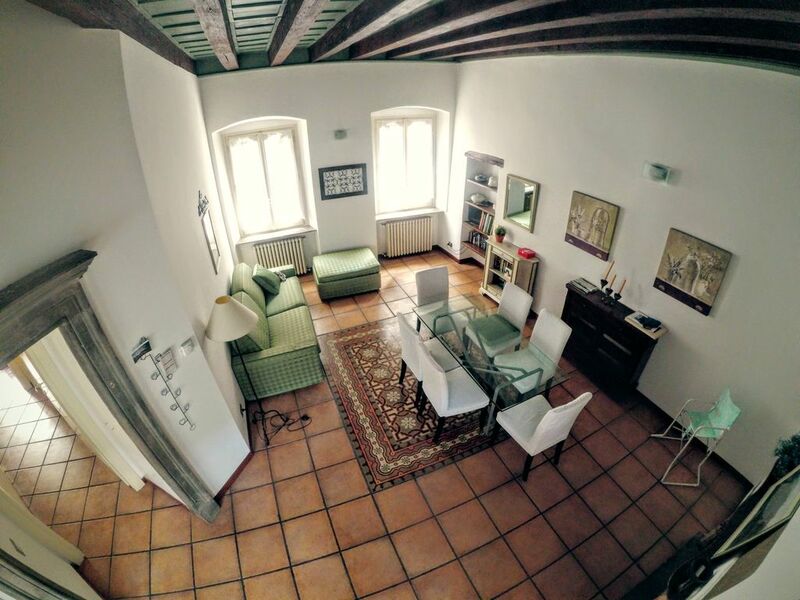 Spacious and comfortable apartment in an old building in Bergamo. Good location for exploring the old town. Our host was so friendly and welcoming. We very much enjoyed our stay. Beautiful spacious rooms, every detail thought of. The upper city of Bergamo is a great vacation spot with as much density of history and great food as you can find anywhere, right outside the door. Make dinner reservations - some of the best restaurants are tiny and people come from all over to eat there. Quick trip by train to Milan and to the beautiful Lake Como region too. Can't name a place I've enjoyed more. Great property. Has all the charm of a historic building, but with modern updates and comforts. The photos do not do justice to the beauty of this home. It is a beautiful place, in a perfect location of the upper city. Very easy to access by car, then park your automobile and walk to all areas of upper city. The property is nicely remodeled to maintain its period details, but provide modern bathroom/kitchen amenities. Mariella's apartment was clean, large, and light-filled! It met our needs completely. We had plenty of room to spread out in the beautifully and tastefully decorated space. The well-stocked kitchen allowed our group of 5 adults to prepare breakfast each day and a few dinners, as well. Mariella met us on arrival to give us a tour of the apartment and a special parking permit for our rental car. Mariella is a lovely and thoughtful host--gracious and informative. Mariella was a wonderful host - picked me up at the bus stop when I arrived. The apartment was spotless, and is very central in the old city. Bergamo itself is lovely. I would certainly rent it again. Grazie Mr Giorgio, in verità anche Lei è stato un ottimo ospite, educato, ordinato e puntuale. Sarò molto felice di rivederla. Lovely apartment in the old city within walking distance of shops and restaurants. There is so much to explore in the old city and it is a wonderful place to walk. (Text automatically translated) From Orio or train station there is a very convenient connection to the city center by bus no. 1A that takes you directly to the funicular. With the same ticket you can climb the hill to the old part of town. From the top station, walk straight ahead along Gombito street, past a small square and at the next junction take the road down the hill on the right (Via San Lorenzo). The apartment is located at number 36.